Ncbody has 20-20 vision on how their behavior affects others—and nobody enjoys hearing about their weaknesses or shortcomings. Thus, it can be a painful experience when others give us feedback—whether it is designed to help or hurt. Depending on our level of confidence or insecurity, we may interpret any mention of our need to improve as a confirmation or proof of our worst fears—that we are lacking something. However, if we are going to walk in the confidence it takes to live our best lives, we must learn how to benefit from such input. Try these four strategies for responding to not-so-pleasant feedback. Listen. Do not interrupt the critic with an explanation or excuse for your behavior. Relax. Let your body language indicate that you are intent on hearing all that the person is saying to you. Avoid smirking, rolling your eyes, or seeming skeptical of what is being said. Instead, try nodding your head (this simply says “I hear you”, not “I agree”), looking the person in the eyes, and asking clarifying questions. This will encourage the constructive confronter to relax also and not to struggle to find the right words to keep from offending you. Most of all, don’t focus on how you will respond; just listen. Intently. Listen to discern hidden motives. Some people simply enjoy being critical and can only feel good about themselves when they diminish others. Look for the kernel of truth. There is usually some smidgen of truth in criticism—especially when you hear it from more than one person. Resist becoming defensive. Know that defensiveness is usually a way of resisting the pain of the truth. Never be afraid of the truth; it will set you free if you embrace it. 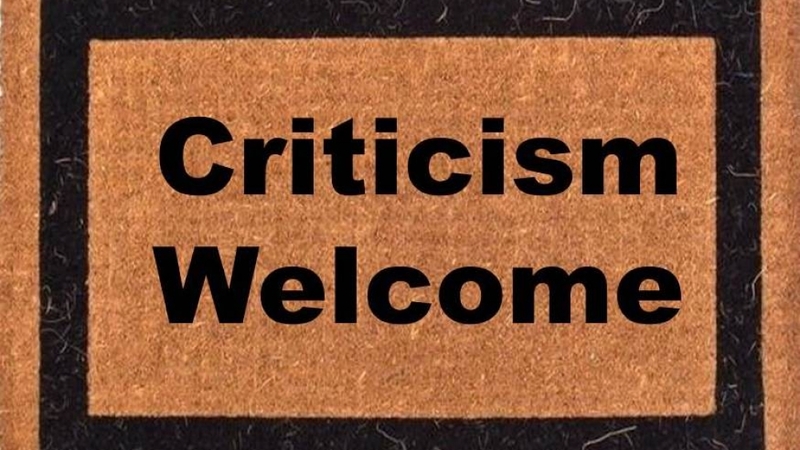 Leave “groundless” criticism behind. Simply say, “Thank you for your input.” You must handle feedback much like you eat bony fish; you eat the flesh (useful) and leave the bones (useless). Don’t spend time rehearsing the encounter afterward. Remember that nobody can please everybody so you have to respond “like a duck”. No matter how much water you pour onto a duck’s back, it simply rolls off. Resolve now that you will not let constructive or destructive criticism make you resentful, zap your confidence, nor steal your joy. Rather, you will use it as a stepping stone to a brighter future.